This clip would be ideal for use as a case study on coastal response to sea-level rise, environmental justice, and first-seen impacts of climate change. This video offers a perspective of Climate Change from the traditional ecological and environmental knowledge of Samoan islanders. 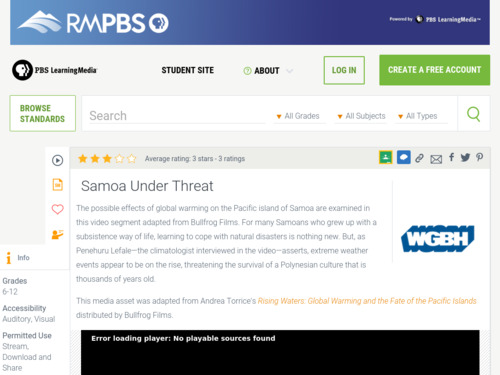 Comments from expert scientist: This video is best for humanizing the impacts of global warming to a specific population of Islanders in Samoa. Not primarily a scientific video. A background essay giving supporting information is available with this video, which highlights negative effects of climate change, specifically global warming. The resolution of the streaming video isn't ideal when expanded on a large screen. 10MB download requires registration with Teachers' Domain.